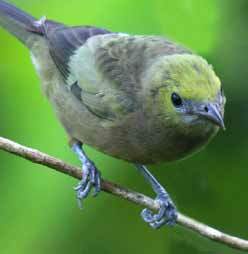 With its olive green plumage the Palm Tanager is a bird that frequently goes unnoticed. These birds can blend into the background whether it happens to be a stern, concrete structure or a delicate green plant. But what they lack in brilliance they make up for in charm. The “Palmiste,” so called because of its affinity for palms, will use anywhere as its playground. These birds twitter away, staccato style, in houses, on wires, on eaves of buildings and even in churches! They also lay claim to certain spots on Asa Wright’s verandah. Our viewing scope is a favourite perch whenever the coast is clear. Last year, one bold bird even succeeded in building a nest, albeit a short-lived one, around a teacup. Quite a few nests can be found in the living room and verandah at the main house. During breeding time, which is continuous throughout the year, you may even get a chance to witness a mother feeding her chicks. Apart from the occasional sip of coffee from the cup of an unsuspecting visitor, the Palm Tanager eats fruit and flower petals or insects when craving a crunchier meal. Their drink of choice is nectar from a variety of flowering plants. Always a social species, the Palmiste is encountered in pairs or groups of up to six or seven. Take a look around and the Palm Tanagers in your neighbourhood will seem to pop out of the background. Come to Asa Wright and you may find a friend in our tiniest members of staff, the Palm Tanagers.